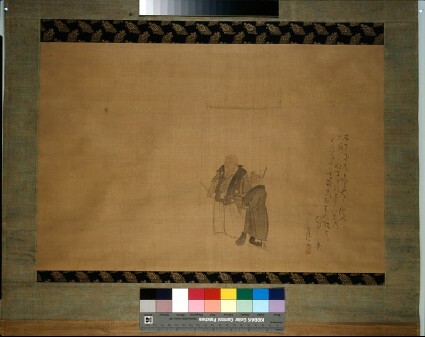 In this subdued, understated composition from Goshun's later years, an elderly couple are placed just right of centre amid a vast blank space. Jo and Uba are painted quietly posing, she with a broom, and he a rake. The story of Jo and Uba is part of the Nō play Takasago. According to legend, the two fell in love when young and lived in happiness until a very old age. Their spirits are said to dwell in a pine tree in Takasago that has a divided trunk. The two are naturally symbols of love and longevity, and images of them are appropriate for wedding gifts and decorations. A minogame, or ancient tortoise, also a symbol of longevity, is seen in the brocade used for the mounting of this hanging scroll. in this latter age, signals blessings. [From Takasago translated in Royall Tyler, trans. and ed.. Japanese Nō Dramas (London: Penguin Books, 1992) 286-7. The section in brackets is not inscribed on the painting but forms the first part of the poem as it appears in the play. I again thank John Carpenter for pointing me towards this reference]. Goshun often used the name Gekkei (Moon Valley) for his signature on his poetry- inspired paintings, as he has done here. The above inscription contains variants from the text of the play of the kind someone writing from memory would make [I am grateful to John Carpenter for making this comment]. As a native of Kyoto, he led a cultured life as the son of an official of the gold mint. He became a student of Yosa Buson in his twenties, with whom he studied haiku poetry and painting. Goshun’s works from this period show an advanced knowl¬edge of literati painting in the Nanga manner, such as Road to Shu and Life in the Mountains in the Michigan University Art Museum [published in Celeste Adams, Heart Mountains and Human Ways, Japanese Landscape and Figure Painting: A Loan Exhibition from the University of Michigan Museum of Art (Houston: Museum of Fine Arts, 1983), 56, 59]. After a series of family losses, Buson encouraged his student to go to Ikeda, close to Osaka. From this time. Goshun’s paintings take a decidedly Maruyama style turn. Though he later returned to Kyoto and worked with Maruyama Ōkyo [Goshun helped to decorate Daijōji temple with other prominent Maruyama school artists from 1787 to 1795], Goshun was still considered primarily Buson’s student. Having mastered both Nanga and Maruyama school techniques, Goshun created his own style known henceforth as the Shijō school, after the location of his studio on ‘fourth avenue’ in Kyoto, In his new style he infused the Maruyama manner of sketching from life with a more subjective and emotional feel. Subsequently, his style spread to become the greatest influence on Japanese painting of the nineteenth century. Goshun produced another larger painting of Jo and Uba in the Itsuo Art Museum in which the benign elderly couple are shown wrinkled to a comical extent [Suntory Art Museum, Itsuō bijutsukan meihinten (Suntory Art Museum, 1971), 30. The Ashmolean painting is the later of these two compositions].